This entry was posted in Art Journal, Art Journal page, Collage, Mixed Media and tagged AJJ, alphabet, Art Journal Journey, Big Brush marker, circles, clear stamps, Creative Expressions, Dylusions Spray Ink, Faber-Castell, Faber-Castell Big Brush marker, Heavy Body Acrylic, Kaisercraft, Liquitex, Liquitex Acrylic, Liquitex Heavy Body Acrylic, Liquitex Inks!, Liquitex Matte Gel Medium, Mask, Matte Gel Medium, Moo Mania & More, Old magazines, Ranger, Ranger Archival Ink, Ranger Dylusions Spray Ink, recycled card, square, stamp, Stamps, Stamps and Stencils, Stencil, The Artistic Stamper, TioT, TioT Design Team, Try it on Tuesday, Try it on Tuesday Design Team, UHU Stic, Uni Pin, Uni Pin marker, Uni Posca, Uni-Posca Paint Pen. Bookmark the permalink. A fabulous page Jo. I love how you were inspired by the street art and Banksy. I loved the photos you shared of the wall art, it must be good to see them for real. Children playing in open spaces is a joyful sight, they have fun and get into the fresh air, I am so pleased it seems a thing from the past that some areas didn’t allow them to play., there was an area in our village with one of those notices, long gone thank goodness. Thank you for this awesome journal page for my AJJ theme Jo and Happy T day wishes. What a fabulous page Jo. I so love how you were inspired by the wonderful street art and by Banksy. I also loved the photos you shared of the street art , thank you very much for shairng! Thank you for this amazing journal page for the AJJ theme Jo and for Moo Mania & More! So much appreciated ! Happy T day and Try It On Tuesday wishes. I am laying in bed with a nasty angina – so no new pages and postings from me. Have to get well soon as I want to celebrate my father’s Birthday at the weekend! wow, what a blue!! just my taste:) great journaling page! banksy also is one of my streetart heroes. i wish i could see these other murals in person! how gorgeous. thanks for sharing the fun! brilliant journal page Jo! I love that vibrant deep blue with the pops of lime green. The street art is really fantastic-wow! Thanks for sharing-and sneaking in the coffee:) Happy T day! Wow, I love this wonderful post with all the gorgous artworks, dear Jo. Great journal page and inspiration! I have to laugh, because it took me awhile to find the cup! Happy Tea Day! For the life of me, I can’t see the take-out coffee box. Maybe I just don’t know what they look like in the UK (grin!). Great page…very different from your usual style at least in my opinion. Thanks for sharing more murals. Wonderful journal page and some fabulous street art for your inspiration! I’m finally back online. I’m sorry I wasn’t here sooner, because I take my hosting duties seriously. I have always loved Banksy. You did a great job interpreting that street art, too. I had NO idea about the back story on the No Ball Games. It all made sense once you explained it. Thanks for sharing it with us at Art Journal Journey, too. I had to check twice to see the take out cup in the last street art photo. That was VERY clever, and the type of T day art I love to see, too. Thanks for sharing it with us for T this Tuesday. Are you ready to show your washi tapes next week? I suspect you will put mine to shame. A fabulous page Jo, love that bright blue colour! Great street art too, no wonder you were inspired by it! Lovely Art Journal page Jo ! !, wonderful background , lovely blue dylusion! Great ! Thank you very much for sharing those so beautiful street Art, love the owl one. Fun page Jo, the use of the posca on the dylusions has given a lovely fresh colour. Great use of that magazine *No Ball Games* always brings the memory of playing two ball up the wall of the multi storey block of flats I was brought up in. There was four signs one on each side not the best place to play two ball and I was forever getting told off for doing it.. hee hee!! Thank you for sharing the Winter Garden Wall Art.. I really do need to see this. A fabulous background for your page Jo, love the vibrant colours. 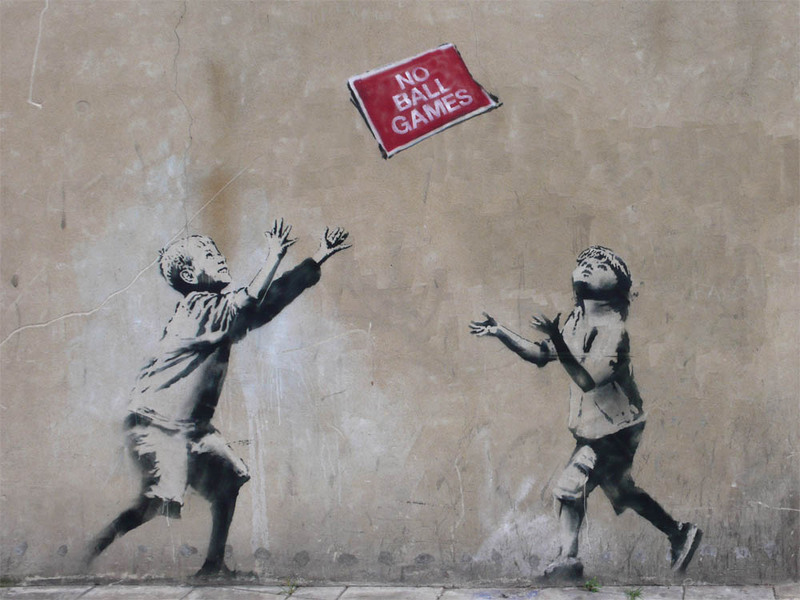 Thanks for sharing the pictures of the street art and the link to the Banksy original. Such a cool page Jo, I love the background and colours! Great to see more of that fabulous street art too! This gorgeous blue made a wonderful background with all the other textures! The pictures and all your other beautiful details made the page perfect! Fantastic childeren page and inspiration. Have a nice weekend Jo!